The health and well being benefits of the great outdoors (and climbing indoors) are numerous. As well as the physical benefits, there are many mental health and social benefits. Physical health: Walking is one of the easiest and cheapest ways of exercising, and an effective way of managing weight. Regular brisk walking will improve performance of the heart, lungs and circulation, as well as lower blood pressure. Find out more about the health benefits of walking on the Ramblers website. Regular walking has been shown to reduce the risk of chronic illnesses, such as heart disease, type 2 diabetes, asthma, stroke and some cancers Find out more about walking for health. Mental health and well being: Walking may be more powerful than we realise. It helps us cope at work by helping de-stress amongst nature, it 'heals' our brains, helps us concentrate, makes us more creative and can help treat depression. Read about six surprising scientific facts about walking. Physical health: Climbing uses lots of muscle groups, both in the upper and lower body. Your back, abdominal and leg muscles all get exercised as well as your ﬁngers, shoulders and arms. Regular climbing can improve stamina and endurance as well as muscle strength. In addition, all the reaching and stretching for holds improves ﬂexibility and agility. Getting out and about in the outdoors, walking to reach the crag you wish to climb on, is also good aerobic exercise. Mental health and well being: Climbing offers a wealth of health benefits that are not just physical. It improves your self esteem, mental agility and self awareness. It’s a great stress-buster and a full body workout, so it’s good for general wellbeing. Climbing requires a lot of problem solving, mental concentration and focus, so it helps sharpen your brain. A lot of people like it as it allows you to escape everyday worries and just focus on the climb. It also can give a great sense of achievement. Read BMC member Jake McMannus’s story of how climbing is helping him to climb out of depression. Climbing can be a very sociable activity. Sport England’s Active People Survey results show that most people say they participate for the social aspect. You develop strong friendships with your climbing partners due to the level of trust involved and through sharing challenges and experiences. The need to respect and preserve the natural environment is never more apparent than to those who visit, explore and enjoy the landscape in which they undertake their activities. Increased public access to the countryside directly supports the Government’s ambition, set out in the Natural Choice: the Natural Environment White Paper, to reconnect people with the natural environment. The NEWP states that “a healthy, properly functioning natural environment is the foundation of sustained economic growth, prospering communities and personal wellbeing” and that “everyone should have fair access to a good quality natural environment”. The UK Government’s National Ecosystem Assessment also asserts that the social benefits of people being able to access and enjoy the countryside should be valued at £484 million per annum. The harmful effects from disconnection with nature – sometimes called ‘Nature Deficit Disorder’ - are increasingly recognised by the scientific community. Public recreation and access to our countryside and green spaces are fundamental to people’s understanding and enjoyment of the natural environment. Unless people are able to access the natural environment they are unlikely to want to take action to enhance / conserve it – supporting recreational activities such as hill walking and mountain climbing are key to connecting the public with the natural environment. As a nation we aren’t doing enough exercise to meet the amount recommended by the physical activity guidelines. Over half of adults (16+) do not do any sport, according to Sport England's Active People Survey. Physical inactivity among today’s 11-25 year olds will cost the UK economy £53.3 billion over their lifetimes, according to a new report The inactivity time bomb (StreetGames/Cebr, 2014). The Walking Works report (Ramblers and Macmillan Cancer Support, 2013) laid out that if more people met the physical activity guidelines by walking it could save 37,000 lives. The Natural Environment White Paper (DEFRA, 2011) highlighted the findings of the UK National Ecosystem Assessment, which asserts that the social benefits of people being able to access and enjoy the countryside should be valued at £484 million per annum. The Reconomics report published in 2014 by the Sport and Recreation Alliance brings together all the existing information, research and evidence relating to the impact of outdoor recreation and provides a compelling case to politicians of the true value of outdoor recreation. The report reveals that getting outdoor recreation is the UK’s favourite pastime, with three in four adults in England regularly getting active outdoors. YOu can download the Reconomics report at www.reconomics.works. What is the BMC doing to help get people active? Active Outdoors: The BMC has an Active Outdoors programme offering subsidised courses for people starting out in hill walking, rock climbing, scrambling and winter skills. We use selected providers to run them at a discount subsidised by Sport England, meaning the public get skills and know-how for less. Outdoor climbing courses: The BMC runs two types of indoor to outdoor rock climbing courses to help people who want to take their first steps climbing outdoors. Ready to Rock takes place at Plas y Brenin, the national mountain centre in Wales and offers courses specifically tailored to young people and families. Rock Out is run in conjunction with climbing walls around the country. BMC Development Team: The BMC currently has three regional development officers whose primary objectives are to support people, primarily in the 18-25 age bracket, who want to learn to climb outside. They are also helping clubs to attract new members. We also have a dedicated hill walking officer. Young people: the BMC has published a free guide for parents of children who are interested in participating in climbing related activities. The BMC also runs the BMC Youth Climbing Series which attracts over 800 young climbers of all levels to take part. 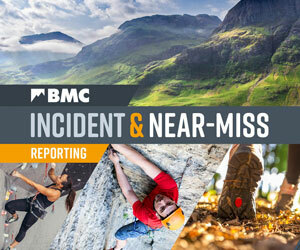 BMC Ambassadors scheme: the BMC has signed up eight inspirational ambassadors to act as role models to inspire and engage young climbers, hill walkers and mountaineers. The BMC Ambassadors initiative aims to encourage more young people to join and get involved with the BMC. Breaking down barriers: the BMC held a successful equity symposium in March 2014 to support black and minority ethnic (BME) participation in the great outdoors, as part of the work of its equity steering group. Outdoor festivals: a series of climbing and hill walking festivals are organised around the country by BMC local area volunteers and all are welcome. Britain on Foot campaign: the BMC is a key supporter of the Britain on Foot campaign to get people active outdoors, led by the Outdoor Industries Association. The BMC's charity – the BMC Access & Conservation Trust – promotes sustainable access to cliffs, mountains and open countryside by facilitating education and conservation projects across the United Kingdom and Ireland. By educating climbers, hill walkers and mountaineers to enjoy outdoor recreation while minimising their impact on the landscape, conserving the UK’s upland resources, and campaigning for improved access rights, ACT enables future generations to continue to enjoy outdoor activities and the physical, mental and social benefits they bring to individual lives and society in general. It helps you cope at work, 'heals' your brain, makes you more creative and it could even be better for you than running. Here are six ways walking could be more powerful than you realise. There are a range of courses, lectures, workshops and training opportunities that the BMC organises to bring the best value possible to its members. According to new figures, around 2.8 million people regularly go hill walking - making it more 'popular' than football, cricket and rugby put together.